I’m so sorry for the last post. My phone froze on me before I could edit and finish my reply, and then it posted my comment. Actually, it’s kind of funny. Here I was talking about not posting till someone’s read your blog and corrected it, and my reply is posted with several mistakes. Anyway, as I said, I never post anything without it first read, edited and corrected by at least one other person. I’ve rebuked people for “Like” my posts on Facebook when it’d said something like, “My good friend just passed away.” What is it that these people “Like”, the fact that my best friend just passed away from cancer? Have we become that careless or lazy that we can’t even write a simple, “Im sorry!”? All that to say, thank you for your reblog. By the way, I wonder how many people who’re not familiar with the Bible, understand the post? Yea, I have not mastered the phone-editing process, not always optimal. And good point about the assumption about Bible knowledge. 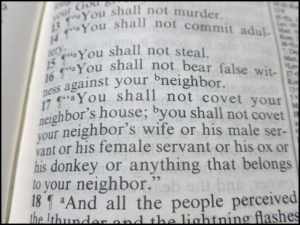 I would think–the Ten Commandments is culturally still relevant–maybe not. As a Christian I try to watch the lingo–I want to speak the truth clearly without church-speak. Thanks for the comment. It takes time, I appreciate it.